Can't remember, when was the last time I posted something about sewing or craft. The story begins with the broken sewing machine. Last time I worked on it was about 4 months ago if I'm not mistaken, when I made a pants from my old ripped sarong. 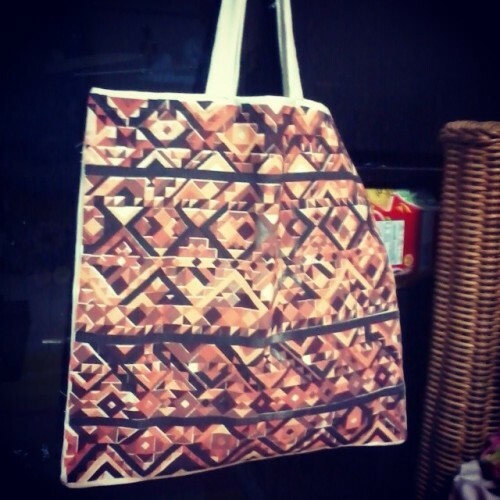 I was too fed up with my final project, so I decided to sew and make a tote bag using my housemate (Nay) printed artworks. When I opened the sewing machine box, there was some water dripping, and when I tried to operate it, it was jammed. Something stuck, and Nay helped me to open the plastic covers (super fragile, blame you factory to cut down the production cost). Well, of course I have no skills to fix it, so I went to the service center far away at Buah Batu, brought the sewing machine weighing like a ton from angkot to angkot. I got it fixed on the next day, went to Buah Batu one more time (I met a couple of "inhaler" boys who begged for money to the angkot passengers), picked her up, ate lunch, couldn't wait to test it. So, yeah, I missed sewing. I missed the way I had to use my hand power to sew on bulky layers. I missed to put the thread through the small hole. I missed the sound and set my right foot on pedal. 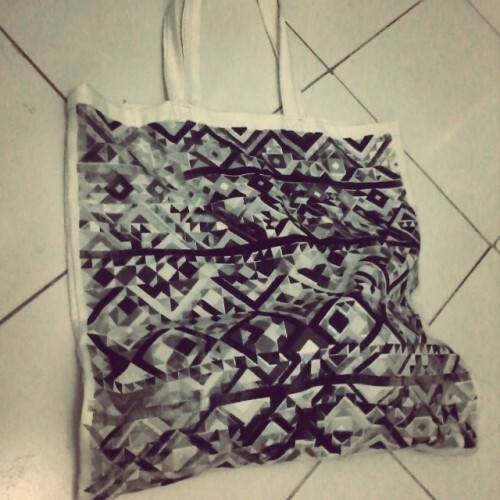 Thanks to Nay, I only attached and transformed them into tote bags. Keep the spirit! One final project and it's finish! Don't give up! ini print maksudnya sablon fit. sebenernya tugas kuliahnya si Nay, limited banget, tinggal beberapa macem warna doang. yang kemaren ada di kosan lo kan ini?